Today we’re going to talk about how you can find a sense of peace by using walnut plantation shutters in your next custom home project. The fact is that custom home building is becoming more and more popular with each passing year as people seek to get exactly what they want and nothing that they don’t. At least, that’s what they think when they go into the process, but often times home builders learn that their customers may not really know what they want. You could find yourself working for someone who changes their mind one hundred times before settling on something that works for them. This is where being a home builder with the ability to offer finishes that can be versatile will come in handy. Walnut plantation shutters are one of the most frequently used window treatments that can offer solutions to even the most indecisive homeowner-to-be. Walnut wood offers something that can be everything from masculine to striking and beautiful. What makes walnut plantation shutters so adaptable for many design elements is that it can vary slightly in color from a light grayish brown to a chocolate brown. Many people may prefer to keep the wood color as is with just a clear finish on the walnut. Of course, if you’re building a home for that person who just can’t make up their mind and the starting color of the walnut plantation shutters aren’t “just right” from the beginning, there are always options available to change the wood coloration in various manners such as; staining, bleaching, distressing, or adding a glossy finish. 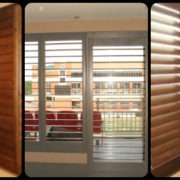 The best part about customizing homes with walnut plantation shutters is that they can be any shape or size. That being said, you don’t have to worry that your unique window shapes will have to be left blank. At Kirtz® Shutters each of our walnut plantation shutters are individually designed and meticulously crafted to fit perfectly. If you’re a home builder looking to add versatile wooden shutters to your next custom built home, let us help you do so. Contact us at 1-800-416-6455!